A 80 m2 ground floor apartment with independent entrance directly onto the old harbour: the front door is just a few metres from the small boats which are moored there. There is a direct access to the garden from the living room-veranda which is next to one double room bedroom. The twin room is behind the the first kitchen (equipped with dishwasher, fridge, oven stove) and in front of the bathroom (with bath-shower and a washing machine). There is another double room (with pirvate entrance from the outside), next it it there ius the second kitchen (fully equipped) togethet witha small bathrrom with shower and little bath. There si an old open stone fireplace which is perfect for grilling food. The garden next to the living room offers idyllic seclusion. This apartment sleeps six people. FREE parking at 300mt distance, in front of the Church. ONE PLACE for boat on request. 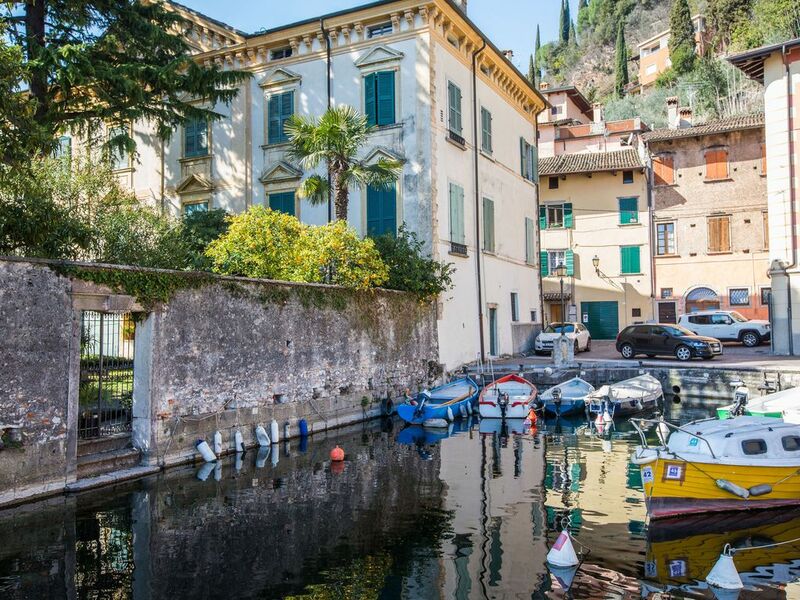 Overlooking Lake Garda in a picturesque old Venetian villa, one of the families who are now also the owners, are offering to all lake lovers, two apartments complete with all modern facilities and furnishings (some antique). The villa was built as a holiday home for the Venetian Comincioli in 1770, on the site of a medieval building. This site was also where ruins were found of an impressive Roman villa which extended to the existing church nearby (where the original floors can still be seen). The apartment IL BATTI named after an olf fisherman who lived here nearly all his life, has an independent entrance opening onto the jetty of the old harbour of Toscolano. The other apartment LE CAMERINE on the second floor of the house (with lift) is on three floors, with the upper floors boasting beautiful views of the lake. Both apartments enjoy full use of the private garden, here is a parking near the church at 300 mt , just a short distance away. Parking is not free, there is daily fee to provide. Information about the area: A short distance from the house (5 minutes by car and 15 minutes on foot) you come to the town of Toscolano. It has many family-run shops, bars, supermarkets, banks, a post office, a petrol station, a police station, well-equipped private beaches and small restaurants (trattorie). There is a market on Thursday mornings and there are also boats and ferries to the next town, Maderno. There are sailing and windsurfing schools both in Toscolano and its neighbouring towns and 5 km north there is an 18 hole golf course. You can catch local varieties of fish directly from the garden of the house which are wonderful fried and grilled on an open fire. The local fish man sells his fresh fish caught on the lake every morning from 6-7 am, as well as other local produce such as freshly laid eggs and great local wine from his family's vineyard. It's often possible to hire a small boat (with or without a boatman) for a swim out in the lake and to moor a small boat on request. ON FOOT: Lake Garda offers to hikers (and mountain bike enthusiasts) a wide range of paths and trails through rolling hills and olive groves which lead up from the coast. From the old part of Toscolano following a path which leaves right from the house and ( only 20 minutes on foot) takes you through lovely countryside to the village of Pulciano and quaint church of Supina, the golf course and then down to the lake side town of Bogliaco, avoiding the busy main road. For mountain trail lovers, just a short car ride away you can find the tall mountains which surround the lake on the northern side and make up part of the Garda National Park. This park is rich with historic nature trails which are well documented and translated into several languages all available from the tourist information centres. (in Maderno, next to the ferry stop for Torri). BY BOAT: From the neighbouring harbour town of Maderno there are daily boats leaving both for the southern part of the lake (Gardone, Salo', Desenzano, Peschiera and Garda) and for the northern part (Gargnano, Limone, Riva and Malcesine). Sunday boat trips and holiday trips of varying length are organized in the summer season, with music and food on board. A car ferry makes regular crossings from the port of Maderno to the town of Torri on the Veronese side of the lake (eastern Gardesana) from here the roads and paths leave for the climb to the great Mount Baldo, this breathraking mountain rich in flora and fauna is a must for all nature lovers. The mountain summit can be reached by cable car from the town of Malcesine. With 2 independent entrance the apartment consists of a hall, two double rooms with double beds, one twin room, two fully l furnished kitchen with cooker (gas), oven, fridge, freezer, dish washer and a beautiful fire place. Two bathrooms with toilette, shower, bath and one living room. Free parking place at 300mt distance, in front of the Church. ONE PLACE for boat on request. Cot free on request. Characterful and well-presented waterfront property in a quiet but convenient location. We really enjoyed the location right next to the little port and the tiny beach round the corner was great for the children. The kitchen was well equipped. Bedrooms were comfortable and the bathrooms were very good but we would have like more seating in the indoor living areas. It was a bit of a shame not to be able to see the lake from inside, but the garden provided great views. Hello! Thank you for your lovely review! I hope to welcome you again in Lake Garda! A great place to by. It was really a grate Location directly at the old harbor. Especially the park like garden in front of the lake and the barbeque are fantastic. Il Batti,Stillvoll bis ins kleinste Detail. Es hat uns allen sehr gut gefallen.Bilder und Beschreibung treffen bis ins kleinste Detail zu.Jederzeit wieder.Danke Mrs.Lucia,IlBatti ist die perfekte Villa fuer einen stillgerechten Aufendhalt am Gardasee. Lovely apartment, wonderful hosts, perfect spot! We booked a week at Il Batti in September and from the moment we arrived we were really impressed. The apartment is packed with character with original features pointed out to us on arrival. Our hosts were amazing, waiting for us when our arrival was late at night because our flight was delayed, right through to mailing back to us a watch which we thought we'd lost during our holiday. We had torrential rains during our stay and our hosts kept in touch in case we had any problems. Beds were comfortable and everything was clean. The apartment is on one level, with a small step here and there. There are two large double bedrooms (one en-suite) and one twin. The bedrooms are spacious and comfortable, the kitchen had all we needed. The only real thing we missed was a sitting room for us all when we had rainy evenings. Outdoor space is superb. Il batti has a table and chairs immediately outside plus another up on the area by the lake. We were literally listening to Lake Garda lapping to the wall as we ate breakfast each day... idyllic! There is also a barbeque which is shared with other guests' use. The garden is used by all the apartments, but there's ample space for everyone, including shady spots and sunny spots, and beds with cushions are also provided. The lake literally laps at the garden, and although the little 'private' beach wasn't perfect, there is a gorgeous little beach across the marina behind the house directly over the road. We swam here and it was totally secluded. The village has one lovely restaurant, we also fetched pizzas to eat in one night and there are a couple of bars within an easy walk. There are also bakeries and grocery shops within the village, and a fabulous street market one day. Parking was usually available in the immediate vicinity of the apartment, but if not it was only a 5 minute walk to the village car park, and free spaces could usually be found. We only had to pay for parking once in the week. Toscalano is situated in a great location for visiting Lake Garda, we travelled easily up and down the west shore, and there is a reliable and regular bus service allowing you to do this if you prefer to leave the car behind. I would not hesitate to recommend this apartment and would love to return. The apartments are located in the little Port of the small town called Toscolano. It is in the territory of the Riviera from Salo'. The nearest city is Brescia.